Marc Buxton continues his look at the All-New Marvel Now! #1s (and sorta #1s). All-New Invaders #1. Writer: James Robinson. Artist: Steve Pugh. 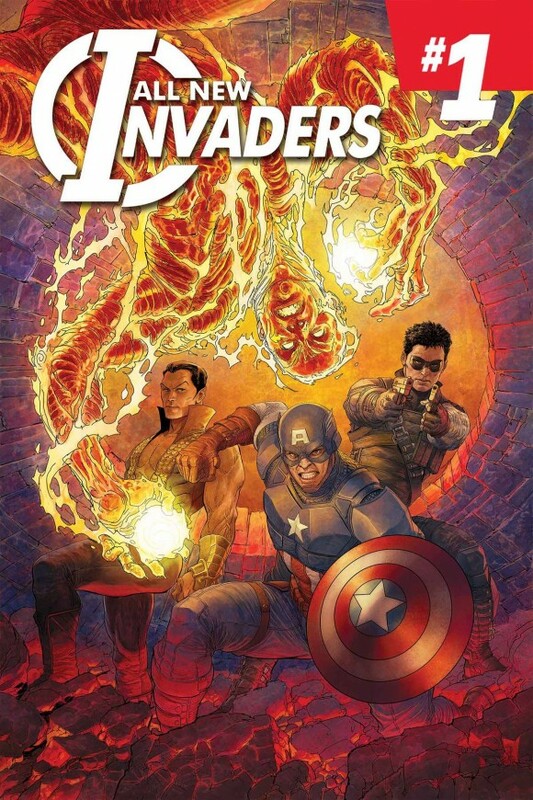 Writer James Robinson has captured the feel of an Invaders book while producing something that is very different than any Invaders title that came before it, creating a bold and exciting new era for a team that always seems to be rooted in nostalgia. Robinson makes the wise move of having Jim Hammond, the original Human Torch be the book’s central character and narrator. The Torch is the most unfamiliar Invaders member to contemporary readers and needs the most expository back-story. He also is the one character in the group that fans have not seen in a bit and Robinson establishes the character’s recent past before shattering it with the coming of the Kree. It seems the original Invaders — the Torch, Namor, and Captain America — are in possession of pieces of a weapon the Nazis once used to control Hela, the Asgardian goddess of death. Robinson deftly ties in myriad elements of the Marvel Universe like the Golden Age, the gods of Asgard, and the cosmic Kree to weave a clear and concise story that justifies the Invaders reuniting in modern times. It’s all very good even if the only Invader that is really featured is the Torch, but the other heroes arrive at the end to set the team up. 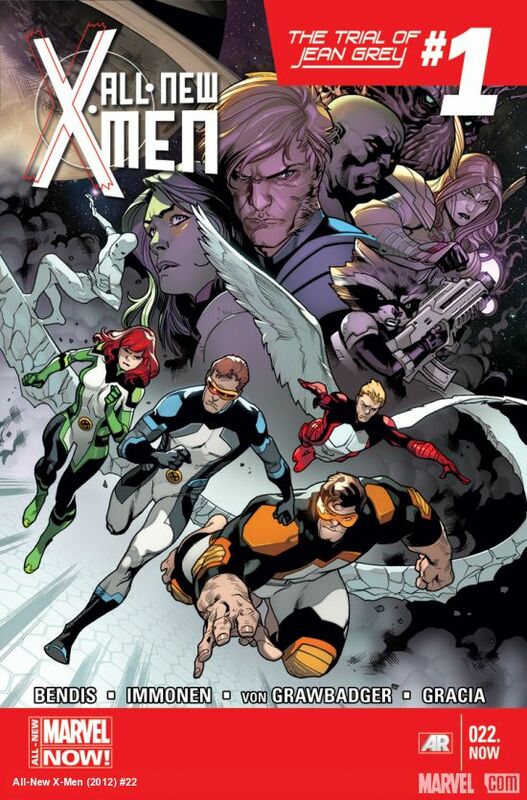 All-New X-Men 22.NOW. Writer: Brian Michael Bendis. Penciller: Stuart Immonen. Inker: Wade Von Grawbadger. The opening arguments of “The Trial of Jean Grey” sees some really good character work by Bendis that establishes where the time-lost, young X-Men are storywise, before the Shi’ar arrives to kick off some pretty intense action. The book is really all Jean, as other than some tidbits of Beast in the lab and Iceman singing Run DMC standards, the book really just focuses on the trial to come. Good character work by Bendis and a beautifully rendered fight by Immonen, but there could stand to be a little more meat on the story. The arrival of the Guardians of the Galaxy ups the ante and bodes well for some fun action as the crossover continues.